Ismael Changawa blamed his poor performance at the championship to the playing surface. (Photo by Shutterspeed). 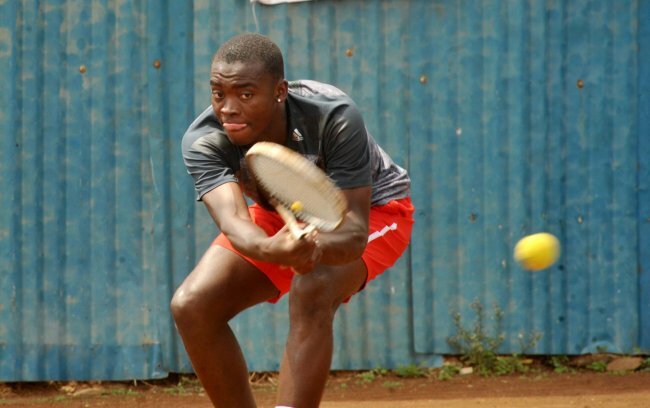 Kenya’s top ranked men’s tennis player Ismael Changawa beat Ethiopia’s Melkamu Sereche to finish seventh in their Africa Cup men’s singles competition played at Nairobi Club on Friday. Sixth seeded Changawa beat the Ethiopian 6-3 in the first set before Melkamu was forced to retire from the match with a strain sustained in the second set with the duo tied at 3-3. Changawa, whose medal hopes were dashed by top seed Amine Ahouda of Morocco in the quarter final, started strongly with his vintage hard forehand hits to rush to a 4-1 lead in the first before cruising to take set. Melkamu came out stronger, matching Changawa's serve for serve but saw his momentum halted after twenty minutes of play in the second set. He had issues about the state of the playing surface which could have affected him throughout the tournament. “I was really focused coming into the match more than ever given that I was disappointed with being eliminated early by my standards. Again the court has not been up to standards so it has also played a part in my performance,” Changawa said after the match. In the women’s singles final, Morocco’s Amine Ahouda put on a dominant display as she made light work of Tunisia’s Moez Echragui by defeating her 6-2, 6-2 to clinch the title. Ahouda rushed to a 4-1 lead in the first set and capitalized on Echargui’s poor delivery service balls. The second set saw Ahouda lead 4-1 and 5-2 respectively as she put the result to bed with the clever little dink to seal the set and match after just one hour of play. Her victory is an epitome of the dominance displayed by North African teams in both the men’s and women’s competition with Kenyan players in particular being put through the sword in their quest for medals. The week long tournament concludes on Sunday.